Inspired by Rudyard Kipling’s poem, the movie is set in mid 1800’s when British regiment had made a settlement in India. With resistance coming from all quarters; there were quite a few rebellious groups formed in order to eliminate the British rule. This movie had one such group who revered Goddess Kali (an important deity in Hindu mythology, Goddess of Blood) dedicated their lives to destroy the British army. The movie is about a Hindu water carrier called ‘Gunga Din’. Since childhood he always wanted to be in the army. He was not allowed and this fact never bothered as he learnt the tricks of army by observing the soldiers carefully. He gets friendly with Sgt Cutter and also tells him about the gold which can be taken back from a Kali temple. Parallely, there is an uprising of a religious group under the leadership of Swami, played by Eduardo Ciannelli. The group had previously attacked many such regiments at different villages and now they had made arrangements to eliminate the British army in that area. I am not comfortable to use the technical word for such groups. Although, in English and in the movie they are referred to as ‘Thuggees’, I am not going to use the word. Its a perception and since it was during the British rule, often such groups were branded as enemies and not seen as patriots. From a movie’s point of view, I can only talk about performances on screen. The movie talks about three army sergeants and the rapport they shared working together. Sgt Archibald Cutter (Cary Grant), Sgt Mac Chesney (Victor Mc Laglen) and Sgt Ballantine (Douglas Fairbank Jr) are fun loving army personnel who love going on adventures together. All was fine until one of them decides to leave the service in order to get married. In what is called as a final mission, the two trick the soon to be groom to be a part of the troop. 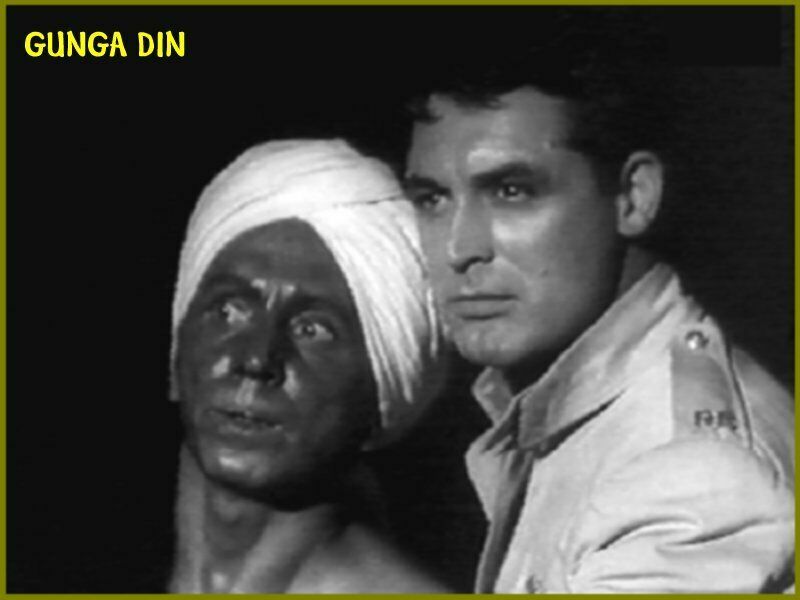 In search of gold, Sgt Cutter and Gunga Din get trapped in a huge gathering of the religious group. As a part of the plan, Sgt Cutter surrenders to the group while instructing Gunga Din to inform his army troop about the place and situation. 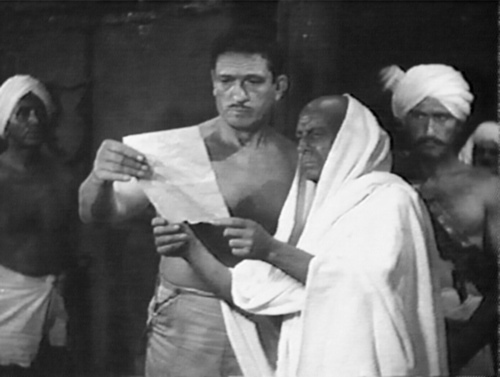 Call it mis-communication; the two friends along with Gunga Din turn up at the temple. All are caught and Gunga Din is branded as a traitor for helping the British. While in temple, the three musketeers get to know the master plan of the rebellion to eliminate the entire British army. 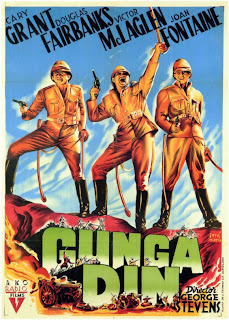 The last part of the movie talks about the gallantry of Gunga Din who risks his life in order to warn the British troops and manages to convey the message of the traps set by the rebellion. On the other hand, it talks about the patriotism of Swami and his men, who are fighting for their freedom, for their country. Although, the methods employed are violent, it wasn’t for fun. They had a purpose and they went about in their own way. George Stevens in a periodic movie to some extent displays his taste for humour showcases army staff enjoying a good laugh as they went about waging wars. Joan Fontaine plays the sole female in few scenes and fails to capture the audience in a bland role. Sam Jaffe in the title role impresses with his tailor made acting of a Hindu water carrier. 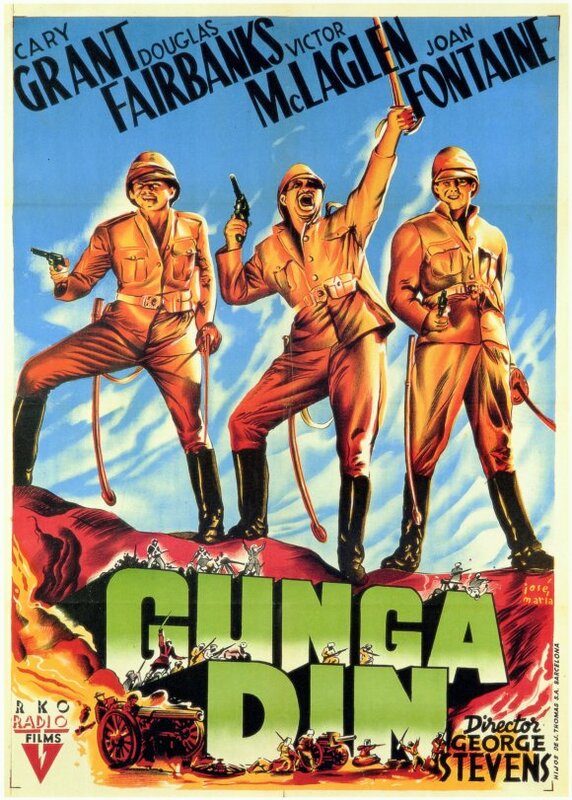 "Tho' I've belted you and flayed you, by the livin' Gawd that made you, you’re a better man than I am, Gunga Din!" – Rudyard Kipling, last line of his highly acclaimed poem of the same name. 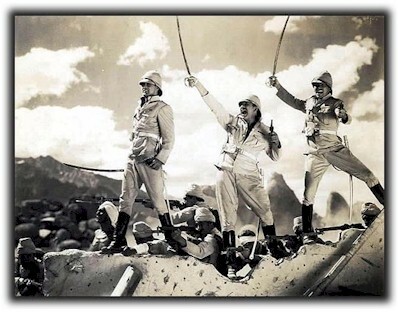 Released in 1939, RKO productions made this movie which was the costliest at that time. 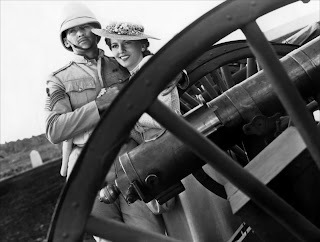 Considering the war scenes and sets resembling rural India the movie was aptly nominated for and Oscar in the Best Cinematography Black and White category.